It is my privilege to teach spiritual formation in one of the nation’s oldest African American theological seminaries, Payne Theological Seminary. In my classes I teach one section on the prayer life of Dr. Martin Luther King, Jr.
As our nation pauses to honor Dr. King, we will celebrate his great civil and political influence. But we will hear nothing of his own understanding of the source of that influence. The fire burning deep in King’s soul was his relationship with God, fanned by his constant prayer life. 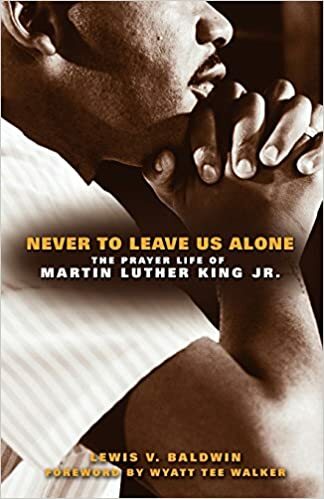 Few scholars have attended to this, says Lewis Baldwin ofVanderbilt University in his book Never to Leave Us Alone: The Prayer Life of Martin Luther King. Our secular media has thrown King’s spiritual life down the Orwellian memory hole. Baldwin corrects this. Prayer was more than a theory or some religious thing for King. King had an actual prayer life, contrary to many religious leaders who talk about praying but don’t find time to do it. He saw it as necessary for changing his own life and the prevailing culture. Baldwin, the great King scholar, shows us that King never separated moral responsibility from a deep personal spirituality and piety. Prayer, for King, was conversation with God. King spent much time alone in prayer. He told students that if you don’t have a deep life of prayer you have no business preaching to others. King saw himself as essentially involved in a “spiritual movement,” not simply a struggle for equal rights, social justice, and peace. King knew, existentially, that real, true prayer involves “a profound surrender of the self to God, not prayer rooted in self-pride, self-righteousness, and self-centeredness.” That becomes the kind of relationship with God that can transform the fabric of reality.